The speed and capacity that USB pendrives have reached has transformed them into the perfect tool to take with us many of the tools that we usually use. There are quite a few programs that have a portable version, from Internet browsers, text editors, office suites and quite a few games of all kinds. And to have them all organized, nothing better than a menu like CodySafe. 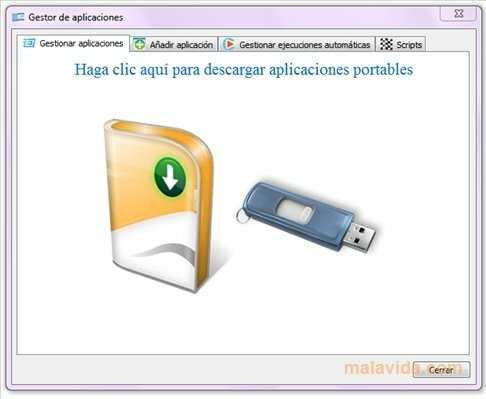 This application's menu opens when we insert the pendrive into any computer to show both the shortcut to the portable applications, as well as shortcuts to various predefined folders, and even a link to download more portable applications. The program's interface is highly customizable, because we'll be able to change its appearance and configure practically everything. As we have mentioned before, CodySafe includes some tools that will allow us to establish if the pendrive is working properly, as well as providing us with a shortcut to be able to properly extract it from the system.